If you are involved in a motor vehicle accident, it is important that you take certain actions at the scene of the accident to collect important evidence and other necessary information to ensure a complete recovery for any damages suffered as a result of the accident. At the time an accident occurs, immediately determine if any person at the scene, including drivers, passengers, pedestrians, and cyclists, is injured and in need of emergency medical attention. 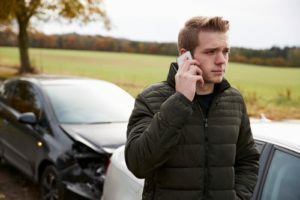 There have been many accident victims who feel fine immediately following an accident only to actually have a severe injury appear at a later date. At every accident, regardless of its perceived seriousness, steps and precautions should be taken to document the event and produce an official report. A police report contains the names and contact information of accident participants and witnesses, as well as a then-current record of road, weather, and traffic conditions. It also contains information such as the drivers’ license numbers of the participants, a sketch of the accident scene, and any citations issued to each driver. Since almost every phone has a camera, anyone may take still photographs and live video of the accident scene, including street, weather, and traffic conditions, and any damage to property. A cell phone camera may also record any evidence of impairment due to drugs or alcohol. Shortly after the accident, it’s a good idea to return to the scene and determine if the responsible governmental body made any subsequent remedial measures affecting the road. It is also important to check your insurance policy’s declaration page to determine coverage limits and other available options. Of course, one of the most important things to do after an accident is to consult with an experienced and knowledgeable personal injury attorney. If you have been injured and require assistance in determining whether you have a potential personal injury cause of action, contact Powell Law at (570) 961-0777 or visit us online. The attorneys and staff of Powell Law carry on the work of a law firm that spans generations and has represented thousands of Pennsylvanians over a period of 113 years. The consultation is free and you don’t pay any fees unless we win your case! Call today.